This pretty diamond and ruby eternity ring oozes feminine elegance. 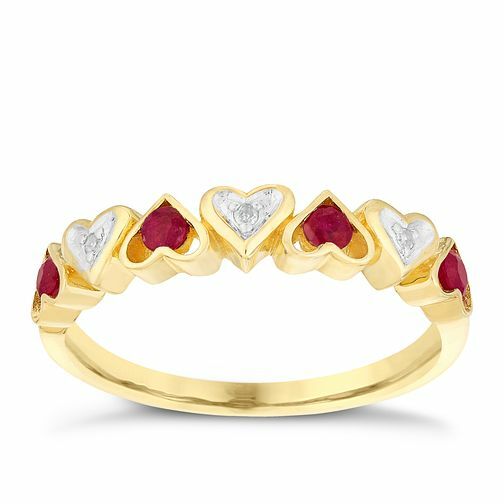 Crafted from luxurious 9ct yellow gold, this stunning ring features a heart shaped design set with dazzling diamonds and rich treated red rubies in an alternating pattern that's the perfect way to show someone special just how much they mean to you. 9ct Yellow Gold Diamond & Treated Ruby Heart Eternity Ring is rated 4.0 out of 5 by 2. Rated 4 out of 5 by Anonymous from Nice contemporary ring at a good price I scoured the internet for a ruby and diamond ring for my wife's birthday, ruby being her birthstone. She doesn't like big showy rings particularly and I wanted something a little different from the many eternity style rings I came across. I liked this because it was quite contemporary. The photos on the website are accurate renditions of it. Also, the photo with the ring on a finger is a good representation of size. It was a good price compared with others I had looked at and was easy to order. It arrived within a few days and the tracking worked pretty well, it came within half an hour of when it was estimated to. A nice ring, well styled and a good, easy buying experience.